Adams reimagines Pabst Blue Ribbon’s iconic logo on over 150 million cans. 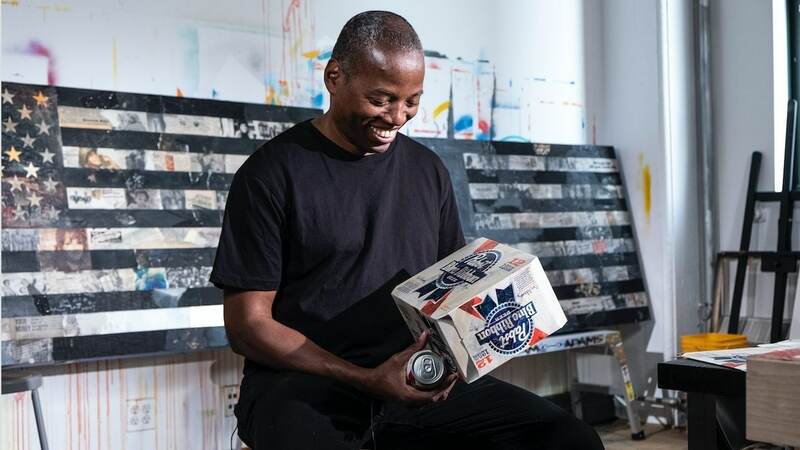 Pabst Blue Ribbon announced a partnership today with pioneering NYC visual artist Cey Adams to launch National Mural Day, a celebration of the world’s oldest and most public visual art form, on May 7. The partnership will also see Cey Adams reimagine Pabst Blue Ribbon’s signature 12oz can and all product packaging this Spring. Pabst Blue Ribbon is committed to making art available to everyone and inspiring America’s doers, change-makers and creatives through art. Murals are the most accessible form of art, and National Mural Day will encourage artists, landlords and civic institutions to collaborate on creating new murals in their community. As part of National Mural Day, Pabst Blue Ribbon will be creating murals in New York City, Philadelphia, Detroit, Los Angeles, Austin, Seattle, Atlanta and other cities. Pabst Blue Ribbon believes art affects positive change, supporting over 200 art events every year, holding its annual Art Can contest which has covered over 300 million cans of Pabst Blue Ribbon with original art from emerging artists since 2014, and commissioning over 175 new murals in America since 2016. Available in late March, Cey’s limited edition re-design will cover over 150 million Pabst Blue Ribbon cans, as well as all product packaging, putting original art from an American icon in the hands of millions. Pabst Blue Ribbon turns 175 years old in 2019, and Cey’s minimalist concept is a contemporary tribute to its famed iconography and historic blue ribbon seal of quality. “Pabst Blue Ribbon is a brand I always planned to explore in my work, and partnering to launch National Mural Day felt right,” said Cey Adams. “Murals and Street Art are an important element of my work. My hope is National Mural Day will become a platform for artists and their communities to celebrate art and its rich history. National Mural Day will offer resources for artists to connect with wall owners in their local area, and Pabst Blue Ribbon has engaged with mural programs around the country, including Mural Arts Philadelphia, to commit resources to support National Mural Day regionally. Cey will also be spotlighting three inspiring, emerging muralists in a video series launched with Pabst Blue Ribbon in mid April. Mural lovers across the country can get involved by taking photos of their favorite murals and uploading them using #NationalMuralDay. Since its founding in 1844, Pabst Blue Ribbon, the original American lager beer, has been connecting with local communities across America. Pabst Blue Ribbon engages and supports individuals who are passionate about forging their own path in life, and will continue to empower new generations who believe in the future of America. Pabst Blue Ribbon is owned by Pabst Brewing Company. American-owned and operated since its founding in Milwaukee in 1844, Pabst Brewing Company is America’s largest privately held brewing company.